Lyman B. Tobin, a Browning teacher for 34 years, became Headmaster in 1948 and under his leadership, public speaking was established as an important part of student life at the School. The tradition is perpetuated today with this contest which takes place at the Lower, Middle and Upper School levels. Objectives are to develop effective public speaking skills, to memorize a significant piece of poetry or prose, to learn how to deliver the piece effectively, and to develop poise and self-confidence speaking in front of an audience. Browning extends its thanks to the contest judges, including Teri Lawrence, head of school at The Resurrection Episcopal Day School; Gina Malin, director of school advisor services at Parents League of New York; and Frank Patti, head of lower school at The Hewitt School. Upper School boys took their turn at public speaking the next day, with nine boys choosing to participate in the annual Lyman B. Tobin Public Speaking Contest. Two separate categories, oral interpretation and original oratory, allowed them to either interpret the work of another or to write and present an original piece. A Form VI boy and a Form IV boy placed first and second in oral interpretation, presenting “The World is a Business” monologue from the movie, “Network,” by Paddy Chayefsky, and “Past, Present and Future of NASA” by Neil Degrasse Tyson, respectively. Winners for original oratory were both Form V boys who presented “The Things We Learn” and “His Legacy,” respectively. The judges included Sarah Lederman, former history department chair and teacher at The Dalton School; Alex Ragone, head of middle and upper schools at City and Country School; and Amani Reed, head of school at The School at Columbia. 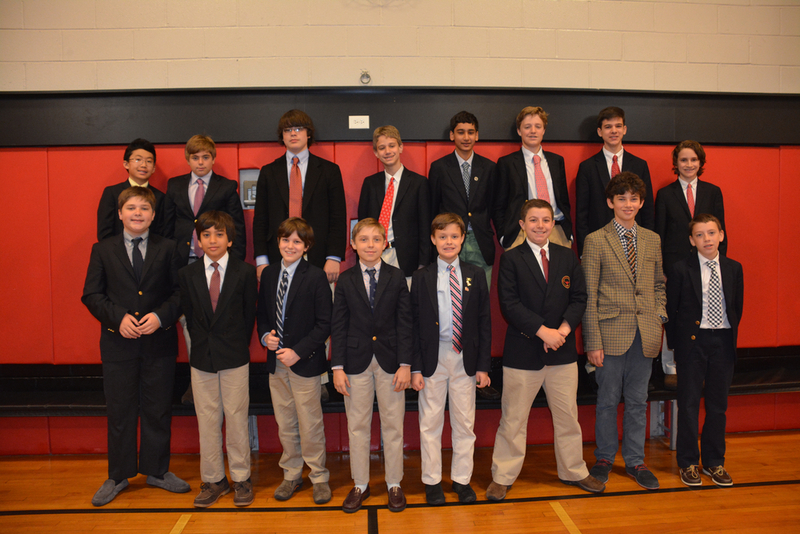 Middle School boys concluded the series of three Lyman B. Tobin Public Speaking Contests on May 2, following the Lower School boys on April 24 and the Upper School boys on April 25. First-place (Gold) winner was a Form II boy, with boys from Forms I and II and Grades Five and Six winning the Silver. Every one of the 16 participants showed amazing skill at memorizing and delivering his recitation in front of the entire community, a daunting task at any age! Reading selections included Jim Valvano’s speech as a recipient of the Arthur Ashe Courage and Humanitarian Award; Eric Schmidt’s commencement address at Boston University; “Digging” by Seamus Heaney; the speech by Herb Brooks from “Miracle” and Nelson Mandela’s speech upon his release from prison. In preparing for this annual event, boys in Grade Five through Form II are required to memorize a significant piece of poetry or prose containing at least 14 lines, with four students from each grade chosen for the finals. Head of Middle School Chris Dunham commended all the participants and thanked the judges, including Matthew Stewart, head of The Caedmon School; Pat Ranar, consultant in the faculty diversity search, Interschool; and Bill McCartney, upper school head at The Town School. The Middle School teachers are to congratulated for all their hard work with these fine public speakers! Newer PostA "Delovely" Evening of Song & Dance!